During CE Week here in New York, I had the opportunity to check out the first examples of what Intel has creatively named “Ultrabooks.” Though they seem to be entirely inspired by the sleek design of Apple’s MacBook Air, the three units from LG, Lenovo, and Samsung attempt to bridge the gap between the power and usability of traditional laptops and the mobility and new capabilities of tablets. 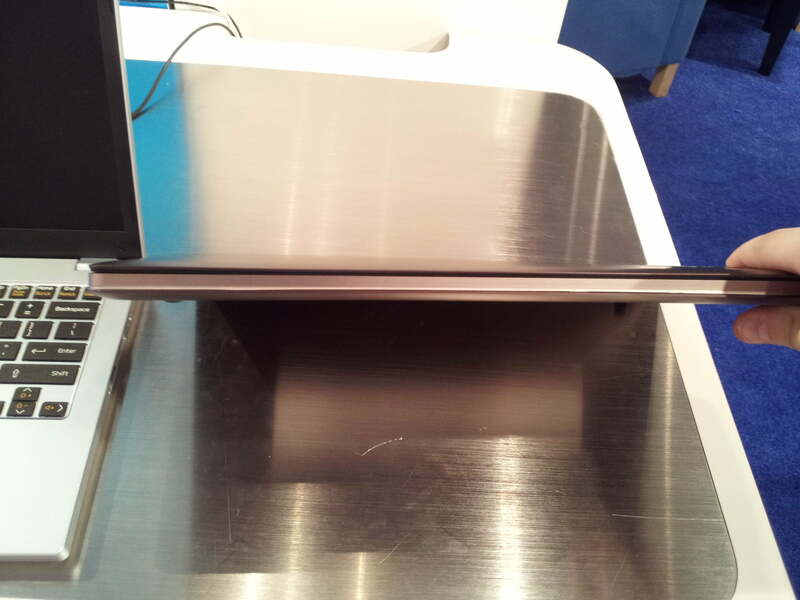 So what makes an Ultrabook so ultra? It’s all inside. 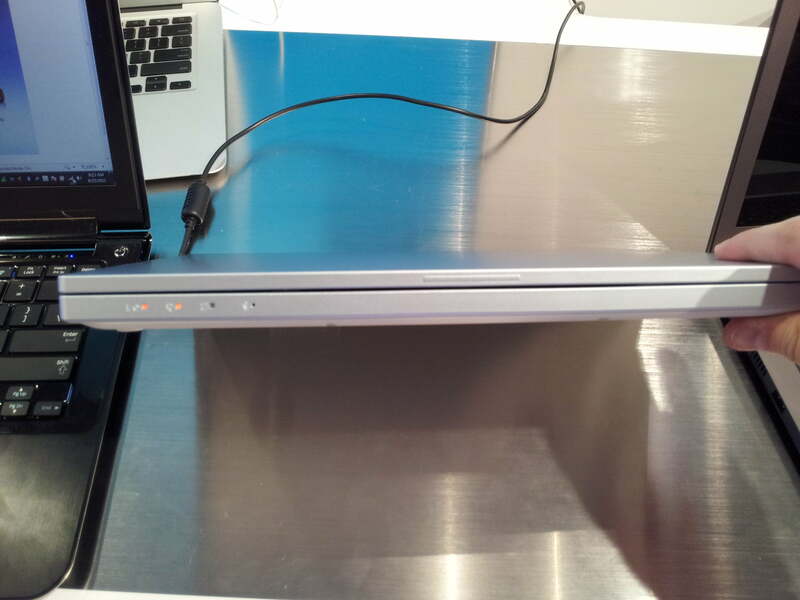 All of the Ultrabooks have small Solid State Drives (SSD) that, like your tablet, smartphone, or Chromebook, enable them to hibernate/sleep and resume within seconds. To accomplish this, the Ultrabooks quickly save all of your open applications and windows into the lightning-fast internal SSD drive as Windows falls asleep. This actually enables the laptop to achieve as much as a 30 day battery life while asleep, much better than the 1-10 days modern laptops get. Intel calls this “Rapid Start” and it’s paired with another new technology called “Smart Connect,” which attempts to mimic smartphone and tablet sleep states by periodically waking your computer from sleep for a few seconds, retrieving email or updates, and then falling back asleep. This way, when you come back to your computer in the morning, it will supposedly be all up to date. Don’t expect your laptop to blink like your phone or tablet when you get a new email though. While those devices get pushed mail, Intel’s solution of waking up from hibernation to demand updates is cool, but also somewhat limited. 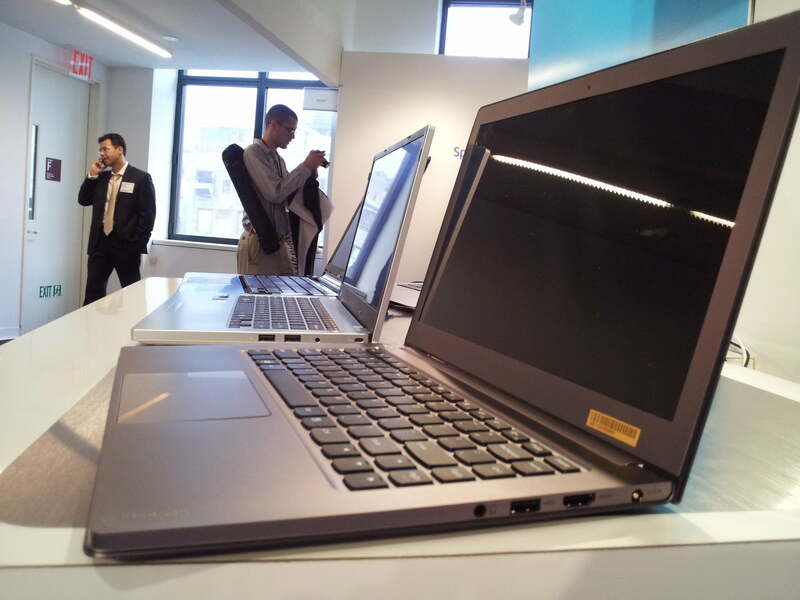 All of the current Ultrabooks also feature thin frames (20mm thick), 11-13-inch displays, Intel’s Core processors, USB 3.0, and Thunderbolt connectivity. They also all achieve at least 7 hours of battery life and should run under $1,000. Though one might think that the Ultrabook is Intel’s attempt to stave off the tablet invasion, which has been eating into sales, looking at and playing around with the devices I noticed less of a tablet influence than an Apple MacBook and netbook influence. 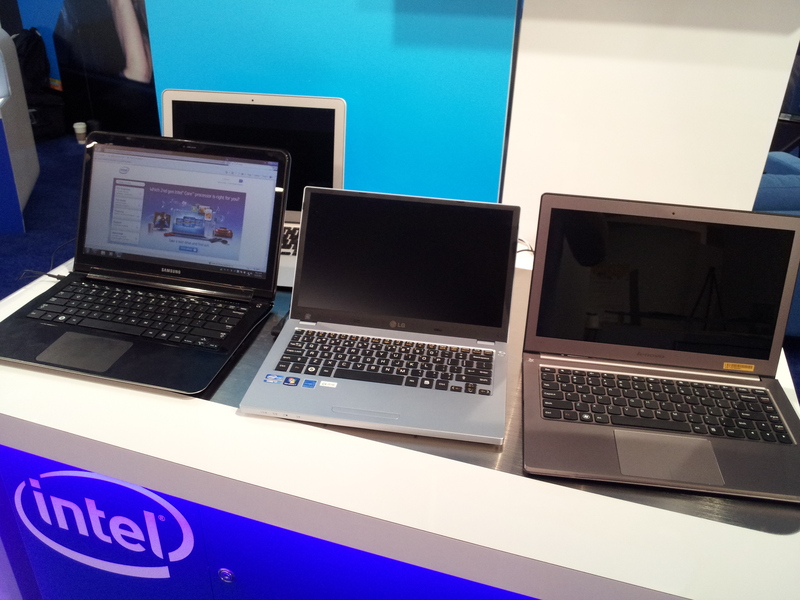 All of these laptops attempt to mimic Apple’s slick designs, right down to the brushed metal, lack of ports (or hidden ports in Samsung’s case), island-style keyboard, thin frame, and lightweight construction. The one feature I’ve always wanted in a PC laptop is also finally available. 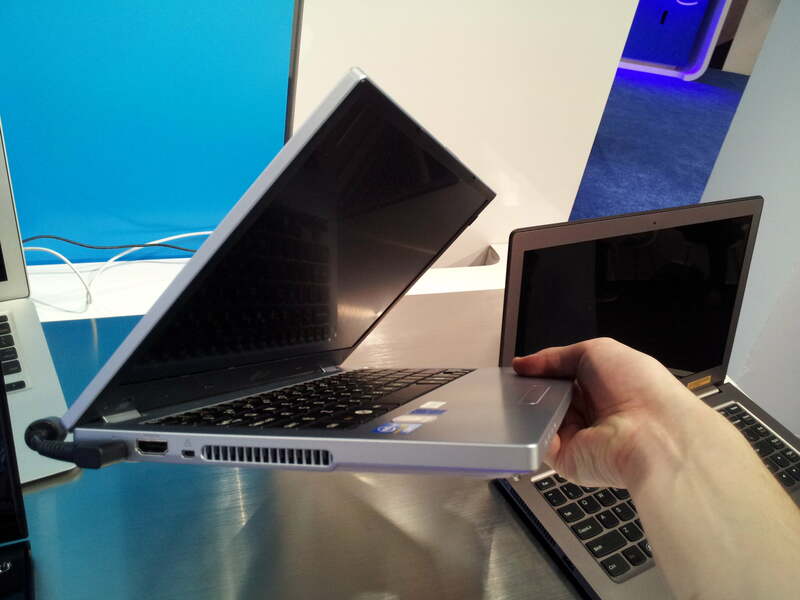 Like a MacBook Pro, you can actually lift an Ultrabook screen up with just one hand. That’s right, you don’t have to pry these laptops open…well except the Lenovo, but hey, it’s a start. These are the kind of small details that consumers look for, so it’s nice that the laptop market is finally catching up a bit. From my first impression, Ultrabooks are little more than a band aid to stop the bleeding of the home computer market. These are honestly the kind of laptops we should have had years ago. It took a plunge in sales and an iPad to get us here, sadly. However, we’re only half way there. It’s becoming quite apparent that the laptop needs easier connectivity options, a touchscreen, and that Windows 7 just wasn’t made for a post-PC world. Windows 8 can’t come fast enough. Having said that, if I had an LG or Samsung Ultrabook, I probably wouldn’t complain. 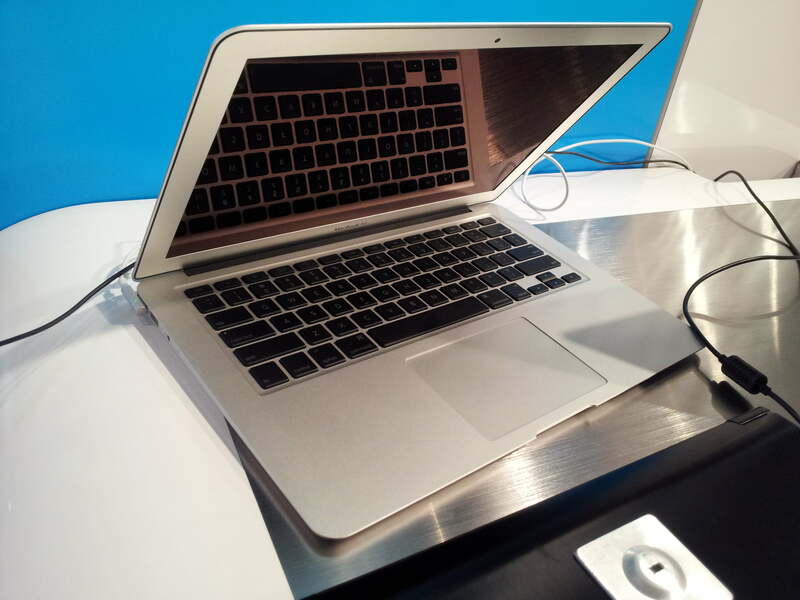 Below is a quick video explanation of some of the new features of the Ultrabook.